This level has easy difficulty. 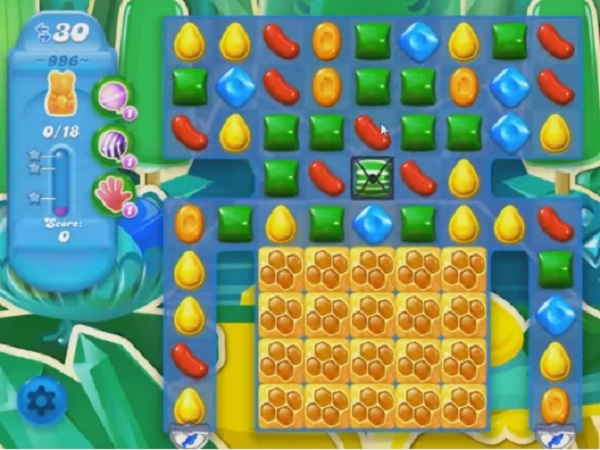 For this level try to play more near to honey blockers and as you have more candies available to play then make special candy. Combine them with each other or play near to honey blockers to break them to save the bears. Hey, I’ve got an idea…how about here’s your bonus for successfully playing the same stupid annoying level 300 times??!! 1) This is not an easy level, unless you can get the bears on first hit 2) not enough moves 3) make all the combos you want, but you’d better have booster hammer/hands saved, or you’re not moving on!! Wat een stomme vertaling,klopt niks van.zoals op de video kan ik het ook,maar de werkelijkheid is heel moeilijk! On what planet is this an easy level!!! Just like the above players said this is a rediculously hard level. Very hard to match up special candies, most of the time they blow up before u get to use them. Not that easy to make enough special candies.. definitely not enough moves to complete this level without boosters. You really need a very lucky board . Even a rainbow Kimmie has not helped. This level may drive many players out of this game. Terrible level….I can’t even get close to passing this level! Please do something! !